NFL Draft Prospect Michael Sam, “I am an openly, proud, gay man.” – Expanding your culture, one touch at a time. Co-Defensive player of the year in the SEC, Michael Sam, a defensive end from Missouri University, has come out as gay. He is eligible for the NFL draft in may, and if drafted, he would become the first ever gay player in the nfl. He is currently projected to be a 2nd-3rd round pick. All I can say is Congratulations. Michael Sam has a lot of balls. He is as courageous as it gets. Admitting your gay in the most stereotypical masculine sport is a scary thing to do. He could see a variety of reactions from players, coaches, and organizations around the league, but he could play for my team any day. Michael does not need to hide who he is, nor does he need to be embarassed. Although there is no precedent set for this, Michael doesnt care. He has always dreamed of being a pro football player and will not let something as stupid as sexual discrimination stop him, “I understand how big this is,” he said. “It’s a big deal. No one has done this before. And it’s kind of a nervous process, but I know what I want to be … I want to be a football player in the NFL.” Michael can be a hero and role model to many kids out there, and can help progress professional sports leagues in a way no one else has done before. 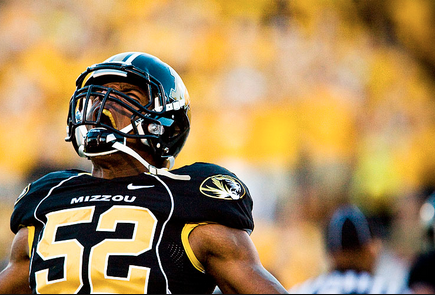 Good for Michael Sam, he is a beast on the football field and thats all that matters.